As soon as I found out that I was having a little girl, I knew that I wanted to make a lavender and teal quilt. 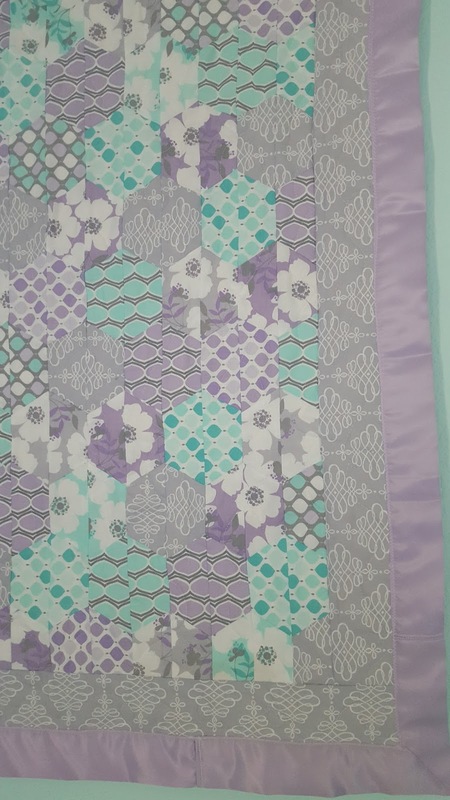 I have also always wanted to make a quilt with tiny hexagons...This quilt is the culmination of a ton of learning, planning, and near-disasters! As I said, hexagons are hard. So when I saw Missouri Star Quilt Company's tutorial with the Half-Hex ruler, I snapped one up and made this quilt with the large ruler to see how it worked before tackling the small ruler. 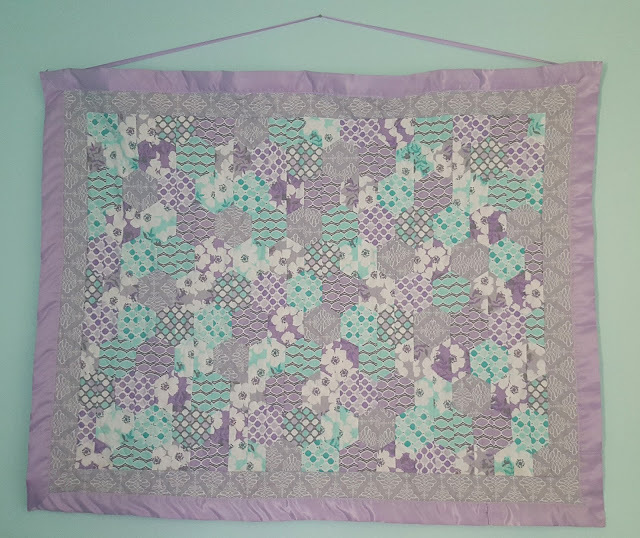 Confident with the ruler's workings, I started looking for the perfect fabric and found this fat quarter pack and fell in love. The line is called "Lavishmint" from Camelot Fabrics. 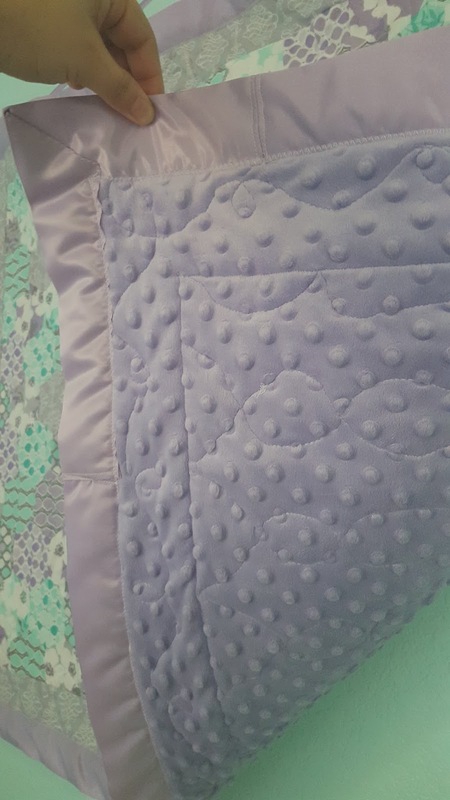 I ordered it online from Missouri Star Quilt Company and waited excitedly...and it never came. Finally I called and they said that oops, they were out, sorry. They refunded my money and gave me a $10 credit. I was WRECKED. (Blame the hormones!) and looked everywhere on the web to find it, and it was sold out and unavailable on the entire internet. Finally, after a week of tears and constant searching, I found yardage available at a Canadian store called The Fabric Snob. Wohoo! I ordered as much as I needed and as much extra as I could afford because I obviously needed curtains and a boppy cover and pillows to match. 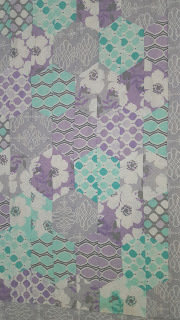 Then I set to cutting 375 tiny half-hexes, arranging them on the floor, and sewing them into rows. 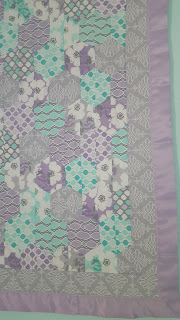 Then, when I started sewing the rows together, I realized that my seam allowance was off and my hexes were squashed. So I seam-ripped about ten rows, ironed them, and sewed them back together again. Finally, I added the gray border, lavender minky backing, quilted it with wavy lines, and added a lavender satin blanky binding. 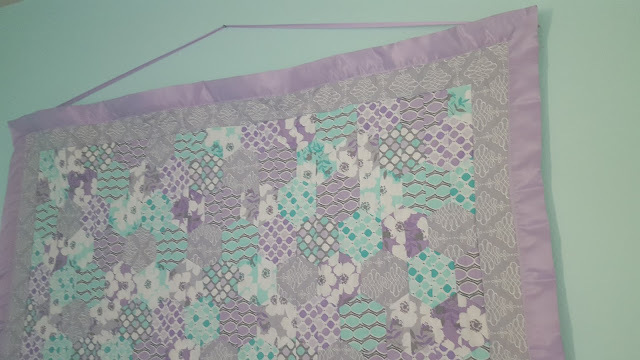 By the time I was done, I loved it so much that I painted the nursery to match and hung it up, and made another quilt for her for every day use!